Solid renal masses contain little or no liquid components, and when examined with CT or MRI, usually (but not always) consist of predominantly enhancing tissue. Enhancement is an important feature; the presence of unequivocal enhancement by CT or MRI signifies that the lesion has a blood supply and is solid. Solid tumors may be benign or malignant. Benign entities encountered in clinical practice include angiomyolipoma and oncocy-toma. 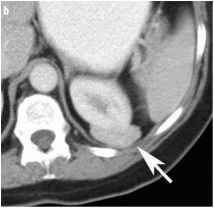 RCC is the most common malignant tumor of the kidney, but other entities such as transitional cell carcinoma, lymphoma, and metastases may present as solitary, solid renal masses. Although most solid renal masses in adults are due to RCC, a substantial fraction of solid renal masses are benign. A recent study of 2,770 resections of solid renal masses found that 12.8% were benign . When stratified by size, benign masses represented 25% of those smaller than 3 cm, 30% of masses less than 2 cm, and 44% of masses smaller than 1 cm. Most benign solid renal masses were angiomyolipomas and oncocytomas. 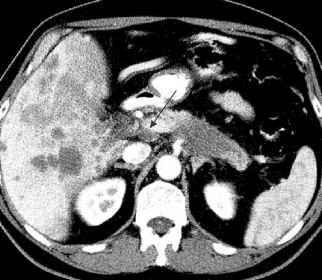 When a solid renal mass is encountered on US, CT, or MRI, a diagnosis of angiomyolipoma should be considered first - well before other entities are contemplated. These lesions are benign and should remain untreated. Large (> 3 cm) lesions may bleed, and therefore should be noted in the patient's medical record, but the risk of bleeding is not high enough to warrant either surgery of frequent follow-up. 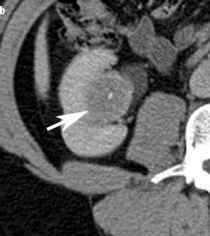 Most angiomyolipomas can be diagnosed with confidence by identifying the presence of fat, indicated by a CT attenuation of less than -10 HU, within a non-calcified renal mass . There have been case reports of fat within calcified [9-12] and non-calcified  RCC and atypical Wilms' tumors , and investigators have cautioned that large malignant renal tumors may appear to contain fat because they have engulfed sinus or perirenal fat [15, 16]. Approximately 5% of angiomy-olipomas contain little or no fat cells, and therefore do not show evidence of fat in imaging studies. Most an-giomyolipomas with minimal or no fat present as small (< 3 cm) hyperdense, homogeneously enhancing renal masses  (Fig. 1). However, masses with these features also may represent RCC (particularly the papillary subtype) (Fig. 2). Therefore, discriminating angiomyolipo-mas with minimal or no fat, from renal cancers (short of resection) requires a percutaneous biopsy. Biopsy can be used to diagnose renal cancers and angiomyolipomas . Small, hyperdense, enhancing masses are referred to radiologists for ablation and it is in this clinical setting that biopsy has been found to be useful . Oncocytomas are generally considered as benign tumors [19, 20]. Homogeneous enhancement and a central scar have been described [21, 22], but are not pathognomonic. These features have also been described in oncocytic RCC. These features may suggest an oncytoma or an oncocytic RCC, which means that less aggressive approaches (e.g., partial nephrectomy, percutaneous tumor ablation) may be considered. Excluding angiomyolipomas and oncocytomas, the majority of solid renal masses are RCC. Therefore, a sol id renal tumor (after a benign tumor is excluded) is typically treated with surgical resection. 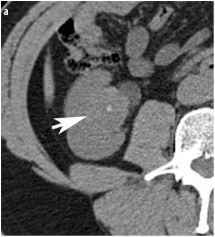 Percutaneous ablation may be considered for small (< 3 cm) tumors, or larger tumors in patients who need nephron-sparing surgery such as those with co-morbid disease . biopsy may be used to diagnose angiomyolipomas so that these patients do not unnecessarily undergo surgical resection or ablation. Similarly, biopsy should be used to diagnose renal masses prior to ablation. Patients referred for ablation might have benign masses .